The annual American Hellenic Educational Progressive Association (AHEPA) Journey to Greece program through Webster University Athens recently completed another successful year, its twelfth. Students of Hellenic descent from all over the U.S. and Canada participated in this month-long heritage program. They studied Greek language, society and culture while earning six academic credits that will transfer back to their home institutions. 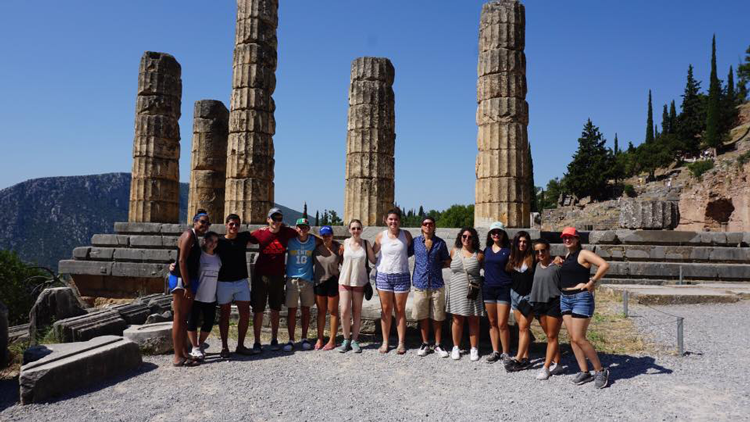 In addition to their courses, students had the chance to explore Athens through daily field trips to archaeological sites and museums as well as excursions to Ancient Olympia, Mycenae, Epidavros, Delphi, and the monasteries of Meteora. Students also traveled around the island of Crete, learning about the ancient Minoan civilization and modern day Crete. During their visit to the town of Chania, Crete, they were welcomed by the local AHEPA chapter and were interviewed on the Cretan news station, NEA, about the program and their experiences in Greece. They also visited the Ministry of Foreign Affairs and the Hellenic Parliament. At the Ministry of Foreign Affairs, they were addressed by the deputy minister, Terens–Nickolaos Quick, who welcomed and commended them for exploring and learning more about their Hellenic roots. He spoke highly of the special relationship between Greece and the Greek Diaspora and AHEPA organization and how they have shown support to Greece through the years. The students also met with the Greek Ambassador for North America, Dimitris Alexandrakis, who spoke to them about strong U.S.-Greece relations that exist to this day. During their visit to the Hellenic Parliament, students were given a guided tour of the building and learned about its historical significance and had the opportunity to view parliament in session. The highlight of the program, however, was the opportunity to bond with each other. From their classes and travels around Greece to the various barbeque's, receptions and lunches held in their honor to the relaxing beach days, the students enjoyed getting to know each other. They formed long-lasting friendships and noted that their time in Greece was nothing but incredible. Program student Constantine Karalis from University of California Santa Barbara raved about the experience. "Not only did the program expose us to everyday instances of living in Greece, but it re-solidified us to our Grecian roots," said Karalis. "Getting to interact with other Greek-American and Canadian students was an eye-opening experience as I got to interact with others that had similar background stories to mine." 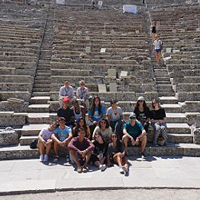 To learn more about programs and study abroad opportunities in Athens, please visit Webster Athens online. AHEPA was founded on July 26, 1922, in response to the evils of bigotry and racism that emerged in early 20th century American society. It also helped Greek immigrants assimilate into society. Today, AHEPA brings the ideals of ancient Greece, which includes philanthropy, education, civic responsibility, and family and individual excellence to the community. The AHEPA Journey to Greece program is open to any student of Greek descent who wants to learn more about his/her Hellenic roots, earn academic credit, create a connection to Greece and meet friends to last a lifetime. To learn more about the Journey to Greece program, please visit the AHEPA site.